Nice and easy there, toy collector. Hand over your wallet and nobody gets blown away—this amazing Leia wouldn’t give two hoots that your blaster was set to stun! 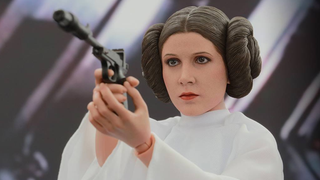 Yes, finally, Hot Toys are bringing the exquisitely detailed hair buns of A New Hope-era Princess Leia to their increasingly impressive line of Star Wars figures, and much to our collective non-surprise, she looks absolutely incredible. I guess there’s not actually much to get wrong with this Leia, considering she’s so plainly dressed, but as ever with Hot Toys, everything that is done is top notch. The sculpt, if a little emotionless, is spot-on to a young Carrie Fisher, and the tailoring on her dress perfectly captures the billowy nature of the original without look like it’s too ill-fitting or baggy on a figure of this scale, as clothing often tends to look. There may may not be a lot to get wrong, but everything is gotten so right that it’s more than welcome to see this particular incarnation of Leia getting her dues. The only slight downside is the ball jointed wrist reminds you you’re looking at a figure, rather than a de-aged and miniaturised Carrie Fisher created through whatever black magicks Hot Toys tends to employ while making these things. Leia herself is sparsely accessorised (which hopefully means she’ll be slightly less pricey than your usual Hot Toys), coming with a few alternate hands, a Stormtrooper rifle, and her trusty sporting blaster from the movie’s opening scenes aboard the Tantive IV. When Sideshow gets their mitts on her for distribution, there’ll also be an as-yet-unrevealed special backdrop to go with her too. Hot Toys have yet to reveal a price, or even when Leia is out, but at this point, expect her sometime in the middle of next year. 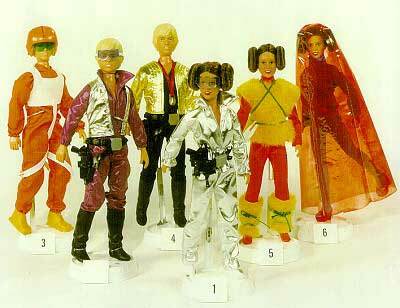 Hopefully there’ll be more Leias on the way—Hot Toys’ Star Wars line just needs to basically become an insanely detailed and much more expensive version of Kenner’s original doll line and give us myriad Leia’s in increasingly ridiculous outfits.